Some rules are NOT made to be broken. That is true of the rules used in a chemistry lab. They are really, truly for your safety and not your humiliation. You say, "But it's only water." Even if it is, how clean do you think that glassware really is? Using disposable pipettes? I know lots of people who rinse them and put them back! Learn to use the pipette bulb or automated pipetter. Don't pipette by mouth at home either. Gasoline and kerosene should be obvious, but people get hospitalized or die every year, right? I know someone who used his mouth to start the suction on a waterbed to drain it. Do you know what they put in some waterbed additives? Carbon-14. Mmmm...radiation. He couldn't retch fast enough! The lesson is that even seemingly harmless substances may be dangerous! A Material Safety Data Sheet (MSDS) should be available for every chemical you use in lab. Read these and follow the recommendations for safe use and disposal of the material. No sandals, no clothes you love more than life, no contact lenses, and long pants are preferable to shorts or short skirts. Tie long hair back. Wear safety goggles and a lab coat. Even if you aren't clumsy, someone else in the lab probably is. If you take even a few chemistry courses you will probably see people set themselves on fire, spill acid on themselves, others, or notes, splash themselves in the eye, etc. Don't be the bad example to others, remembered for all time for something stupid! And know how to use it! Given that some people (possibly you) will need them, know the locations of the fire blanket, extinguishers, eyewash, and shower. Ask for demonstrations! If the eyewash hasn't been used in a while the discoloration of the water is usually sufficient to inspire use of safety glasses. For many chemicals, if you can smell them then you are exposing yourself to a dose that can harm you! 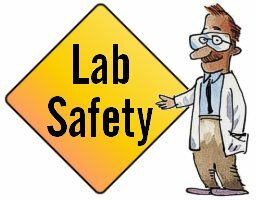 If the safety information says that a chemical should only be used inside a fume hood, then don't use it anywhere else. This isn't cooking class - don't taste your experiments! Some chemicals can be washed down the drain, while others require a different method of disposal. If a chemical can go in the sink, be sure to wash it away rather than risk an unexpected reaction between chemical 'leftovers' later. It's tempting, but oh so dangerous... just don't do it! Not after lab, on the assumption that it will be neater. Put data directly in your lab book rather than transcribing from another source (e.g., notebook or lab partner). There are lots of reasons for this, but the practical one is that it is much harder for the data to get lost in your lab book. For some experiments, it may be helpful to take data before lab. No, I'm not telling you to dry-lab or cheat, but being able to project likely data will help you catch bad lab procedure before you are three hours or so into a project. Know what to expect. You should always read the experiment in advance.